As a television producer, I've been so fortunate to spend much of my time traveling throughout the country and abroad. Although I adore Italy and hope to spend a year there someday, my absolute favorite place I've ever been is right here in the state of Georgia. 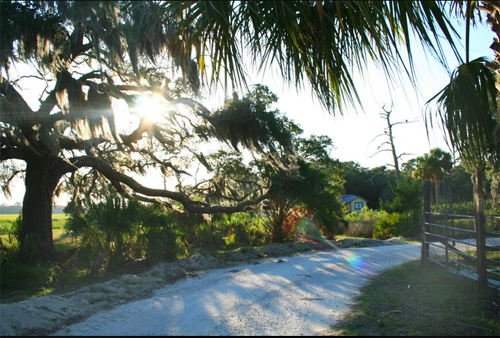 It's called Little St. Simons Island, a little known private island about an hour south of Savannah. I first visited the island on a tv shoot for TBS. As they only allow 30 guests a night on the 10,000 acre island, it's a nature lover's paradise. This island has never been forested and contains a bevy of incredible natural treasures, including an untouched maritime forest and a 7 mile beach- most often without a soul on it nor a building in sight. If you like solitude, you'd love LSSI. This porch above is found at the main gathering spot on the island, The Hunting Lodge, built in 1917. 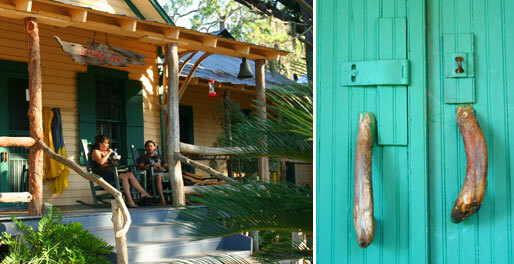 The porch posts and door handles are all made from the cedar trees found on the island. Rocking chairs abound on this wraparound porch...but of course. After a bike ride to the beach and many glimpses of wildlife, I love to return to home base and relax on the lodge's porch. You'll soon see an amazing variety of birds that are plentiful, as well as a few of the hundreds of armadillos on the island. I visited last with my friends Tiffany and Jeff, featured above and to the left, as well as our wonderful new friend we met during the daily happy hour, Jo. I recommend spending some time here if you can. They offer day trips as well which are a perfect way to immerse yourself in this magical world away from home- away from every stress, every worry.